w/LAKEFRONT custom 4 BR ranch w/2 BR carriage house & 8 garage bays! 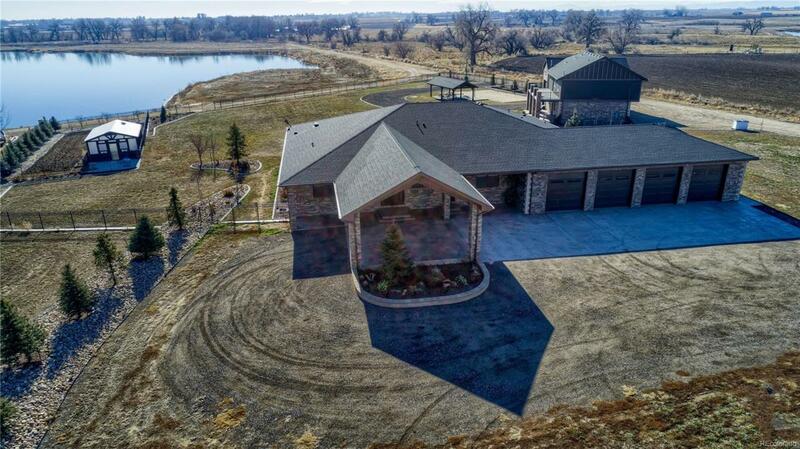 4 ac lot on Lakota Lake plus an 18 ac lot w/bass stocked pond & the Big Thompson River running through it! Jaw dropping high end finishes throughout the house & carriage house! Entertainer's dream kitchen w/2 islands, Sub-Zero Fridge, Wolf gas range, double ovens, electric grill, refrigerated drawers & ice maker. Master retreat w/fireplace & luxury bath w/steam shower & dry sauna! Interior & exterior surround sound, volleyball court, pergola, garden & greenhouse. High end security system w/24 cameras. Boat & jet ski all summer! Hunt & fish the land. Black iron fencing around 2 ac of the house. Peach, apple, pear & cherry trees.